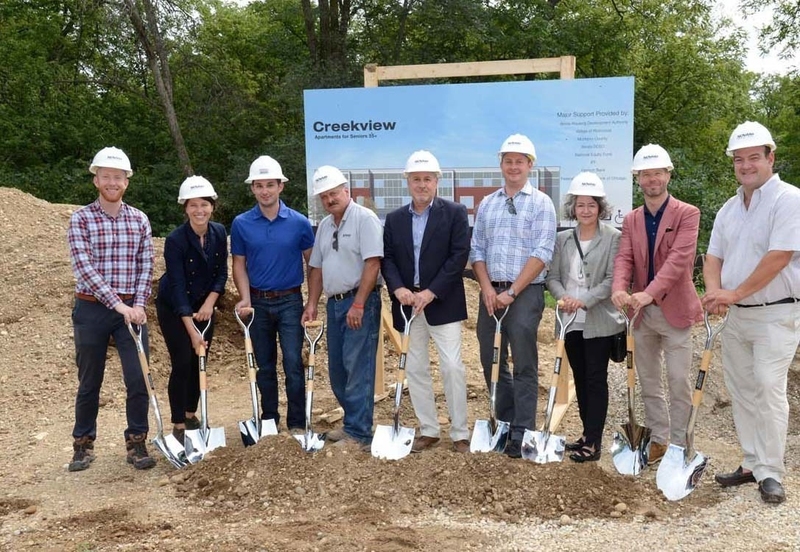 RICHMOND, Ill., Aug. 30, 2016 /PRNewswire/ — A previously vacant lot is on its way to being home to a new 22,000 square foot affordable senior living apartment complex. This construction celebration took place on August 26th at 5615 Liberty Street and included the following high-profile attendees: 32nd District State Senator, Pamela Althoff; Christine Moran from the Illinois Housing Development Authority, Village of Richmond President, Peter Koenig; David Gottlieb, Executive Director – Full Circle Communities. Novak Construction was represented by Vice President, Greg Terwilliger, who acknowledged all of the constituencies that made this project possible – Full Circle, IHDA and the Village of Richmond. “This project really strengthens Novak’s expanding multi-family portfolio that currently includes over $100 million of senior housing and market rate apartments under construction,” he noted. Creekview Construction Team (from left to right) Jordan Bartle, Full Circle Communities, Lindsey Haines, Full Circle Communities, Blake Harmon, Novak Construction, Jim Keiler, Novak Construction, Greg Terwilliger, Novak Construction, Ryan Solum, Manhard Consulting, Therese Thompson, Cordogan Clark & Associates, Joshua Wilmoth, Full Circle Communities and Charles “Chip” Eldredge III, Charles Eldredge Real Estate. Construction is well underway to deliver this exciting new development that will serve low income seniors in need of secure housing. It is situated adjacent to a walking trail and will feature services focused on health and wellness for seniors 55 and older. The building will have 25 accessible units with 4 two-bedroom and 21 one-bedroom units, a computer lab, a library, community room and an on-site property management office. “Concierge amenities” – transportation services, case management, medical screenings, health and fitness resources and other community activities – will be available as well. A natural wetlands buffer and generous landscaping will provide for an environmentally-friendly outdoor setting. Project completion is slated for year-end 2016. Celebrating its 36th year, Novak Construction (www.novakconstruction.com), founded by John Novak in 1980, is a top tier, nationally-recognized General Contractor and Construction Management firm known for its well-rounded portfolio and many projects in the retail, industrial, corporate, institutional, healthcare, hospitality, and multi-family/mixed-use sectors. Novak Construction has consistently been named as one of Chicago’s Top General Contractors. In October 2015, Novak Construction Company was awarded AIA Chicago’s Design Excellence Award – General Contractor for its By The Hand Club for Kids project.